Figure 13.1. 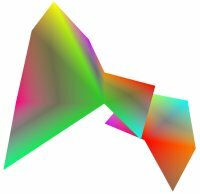 Nonplanar vertices in a single polygon are undesirable because triangulation possibilities are inherently ambiguous and unresolvable. 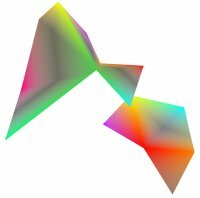 Two quite-different pairs of triangles can be produced from a single set of four nonplanar points. Figure 13.2. Varying a normal vector toward (or away from) a light source increases (or reduces) the computed intensity of a viewed pixel. Figure 13.3. Modification of normals in the example scene demonstrates special effects that vary shading. Figure 13.4. TriangleSet consisting of three triangles and nine separate vertices. Figure 13.5. Morphing a pyramid into a cube by animating a TriangleSet. This sequence of images shows (clockwise from top left) an initial pyramid, intermediate pyramid to cube, cube, and intermediate cube to pyramid. Figure 13.6. TriangleFanSet example showing two fan sets. 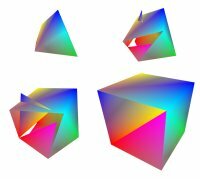 Each set is colored by vertex. Figure 13.7. TriangleStripSet example using the same nine vertices used for TriangleSet example. Figure 13.8. IndexedTriangleSet example using the nine vertices previously defined. Figure 13.9. IndexedTriangleFanSet example showing two fan sets, producing the same fan sets as in the TriangleFanSet example. Figure 13.10. IndexedTriangleStripSet example, producing two strips using the same nine vertices as in many of the other examples. These strips match the TriangleStripSet example.